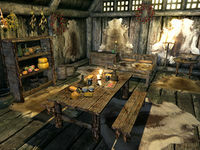 Lylvieve Family's House is a small farmhouse on the northwestern side of Dragon Bridge, located next to Horgeir's House. It is home to Azzada Lylvieve, his wife Michel, and their children, Julienne and Clinton. It consists of one zone, Lylvieve Family's House. There are two levels to this home, including the ground floor and the basement. Upon entering, the right side holds a bedroom area, along the east wall. The double bed (belonging to the Lylvieve Family House Occupants faction) is flanked by a small table to the right and a non-respawning dresser to the left. Atop the table are five loose gold coins and a basket containing four chicken's eggs. The dresser holds a common soul gem (filled), two blue mountain flowers, two purple mountain flowers, a potion of magicka, and a potion of plentiful stamina. Along the north wall is a set of shelves holding four bottles of wine and one bottle of alto wine on the top shelf, along with three loaves of bread, three green apples, two red apples, a boiled creme treat, and two goat cheese wheels on the middle shelf. On the floor to the right of these shelves is a woven basket containing three pine thrush eggs. Above the shelves are some hanging ingredients, including two garlic braids, one dried frost mirriam, and two portions of dried elves ear. At the center of the room is a large dining table which holds a messy arrangement of food, including two goat cheese wedges, one eidar cheese wedge, three loaves of bread, two chicken's eggs, two bottles of alto wine, and two pieces of salmon meat. In the southwest corner of the room, there are two respawning meat barrels. Proceeding down the stairs to the basement, the children's bedroom area is along the east wall, while the rest of the room is used for general storage. A child's bed owned by Clinton is in the northeast corner, while a single bed owned by Julienne is in the southeast corner. At the foot of each bed is a small non-respawning chest. Along the north wall, there is a small round table holding one goat cheese wedge, one loaf of bread, and two boiled creme treats. To the left of the table is a respawning food barrel, and between them are four freshly caught pheasants hanging above. Another respawning food barrel can be found below the stairs, among various clutter. The front door has a novice lock, the key to which is carried by all four members of the Lylvieve family. 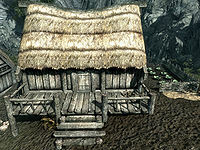 A grain mill can be found behind the house, which can be used to produce flourHF from wheat if Hearthfire is installed. This page was last modified on 12 April 2017, at 04:41.